The arrival of mobile search and social buy buttons are both an opportunity and a threat to online retailers — and will force them to get product content right. GetElastic connected with Mike Lapchick, product content expert and founder and CEO Shotfarm to answer the big questions around buy buttons and product content. How will selling direct through social channels be different than traditional e-commerce and mobile-commerce? Until just recently, the extent of social network commerce was limited to referral traffic. Facebook, Pinterest, or Twitter was the place for product reviews and sharing. Social platforms would direct consumers to the retailer’s product page for detailed information and purchasing. Now, with the upcoming launch of “buy” buttons on Twitter and Facebook, consumers are going to have purchasing power right from the social network’s site. Traditional digital commerce relies on making sure websites look good, scale, and are accurate. Social commerce relies on quickly communicating product information while making it as easy as possible for consumers to buy products. Social buy buttons bring together e-commerce and m-commerce, while adding new ways to purchase products directly on social networks. It’s another step in the evolution of retail, all about speed and convenience. What is product content’s role in social commerce? Typically, the product page for a retailer in social commerce is the last step in the process. Consumers have read about the product via referrals, tweets, and posts and just want to buy the product once they get to the site. Retailers need to realize that social commerce is more reliant on consistent information than e-commerce and mobile commerce ever have been. I expect we are going to see retailers shift to a product sharing and exchange system that better enables them to communicate product information across multiple channels, from the manufacturer’s supply chain to the retailer’s website to social platforms. What challenges do retailers face with the addition of social commerce? Retailers are going to struggle to integrate inventory and product information systems into social sites because most are still using complicated systems to make simple online sales. Syncing product catalogs and management is going to be a challenge because “buy” button purchases are completed through separate payment and order management systems as opposed to posts that link directly to the merchant’s website. Retailers and social media sites have to consistently update each other when a purchase is made and when product information changes unless there is a product content management system that streamlines this process. What do retailers need to do to take advantage of “buy buttons” on social sites? Marketing and supply chain data will need to be synchronized in order for retailers to successfully integrate “buy buttons” into their business model. Product images and details are going to become even more important with “buy” buttons, so retailers need to leverage a data management system that will allow them to easily exchange data and synchronize it across all channels, no matter their own or their manufacturer’s preference for file type. Using a shared data system will enable retailers to integrate “buy” buttons without increasing resource hours and money on updating and exchanging product information. What happens if retailers ignore the rise in social commerce, or fail to update? Retailers risk losing out on a powerful stream of revenue if they fail to integrate social commerce into their business models. However, they may lose even more if they do social commerce wrong. There needs to be a fundamental change in how retailers and manufacturers exchange data so that product information can be easily shared through every channel retailers are selling on. If they don’t, countless resource dollars, mismanaged inventory, and poor customer satisfaction are inevitable. How do you optimize for “merchandising beyond the storefront,” – selling in places that are not the retailer’s own e-commerce storefront? Retailers need to adopt a flexible data exchange system so that any manufacturer, no matter their product and its attributes, can integrate product information quickly and easily. That way, product information can be transferred automatically to social commerce platforms and the data remains consistent. This enables retailers to track inventory and order management systems efficiently and effectively. 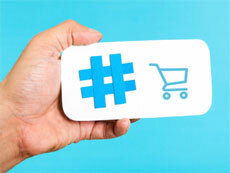 Can you share your top 3 tips for retailers in adding social commerce options? 3. Have flexible infrastructure, especially as “buy buttons” and other direct purchasing options become more common. What do retailers need to do to take advantage of “buy buttons” on social sites? Marketing and supply chain data will need to be synchronized in order for retailers to successfully integrate “buy buttons” into their business model. Product images and details are going to become even more important with “buy” buttons, so retailers need to leverage a data management system that will allow them to easily exchange data and synchronize it across all channels, no matter their own or their manufacturer’s preference for file type. Using a shared data system will enable retailers to integrate “buy” buttons without increasing resource hours and money on updating and exchanging product information. Stop the checkout to save the customer money?